Every time a holy season comes around I try to find meaningful activities to connect the family (mainly my children) with their faith. Going to a Catholic school from K-8 immersed me in my faith in a positive way. I understood why we made sacrifices during Lent and why we reflect on the Lord’s passion and suffering. I realized that my children aren’t getting that same experience in public school. As much as my husband and I try to lead by example, they still need something tangible to see how God works in their lives. I’ve been too busy (and tired) to come up with daily activities for our family for lent. So I looked on Pinterest for some ideas for Lent that would be simple and meaningful for the whole season. 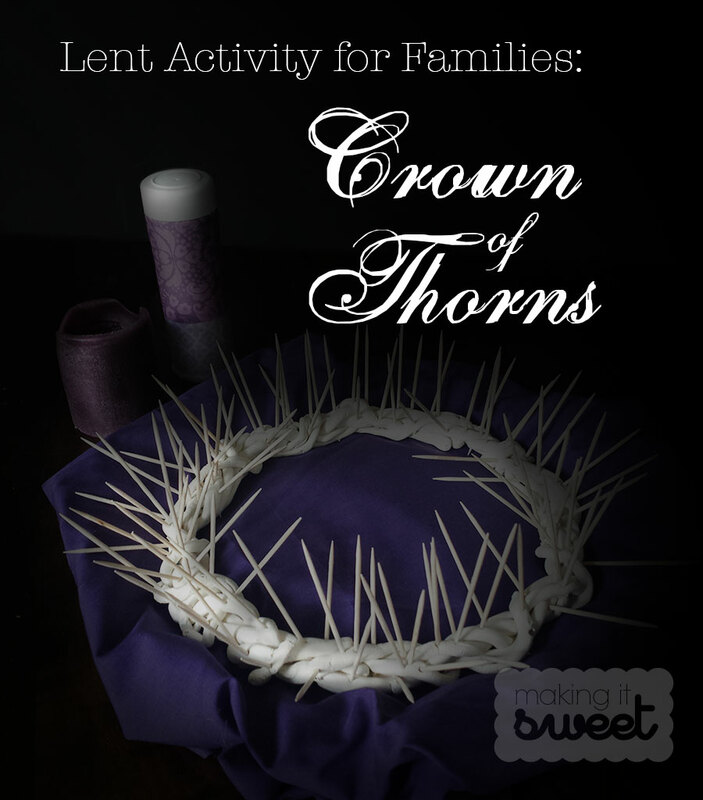 I found several versions of a “crown of thorns.” The idea is that during lent, in addition to giving up something for the whole season, we need to make small sacrifices and do good deeds on a daily basis. For every sacrifice made and good deed done, the kids can pull out a “thorn” from the crown. Each time a thorn is removed, we are lessening the burden on Christ. Wow. So simple, but so powerful. I had my kids help in making the crown a few days before Ash Wednesday. I had them roll Crayola Air Dry Clay into thin ropes and I braided/wove the ropes around each other in a circle to form the base. While the clay was still soft, they stuck as many toothpicks as they could in it. Note: Don’t stick the toothpicks in too far or you will have a hard time pulling them out! Not to mention that the clay will crack. I could see that they understood what was expected of them. I needed a receptacle to put the thorns so I found an old sprinkle jar and covered it with paper using Aleene’s All-Purpose Tacky Glue and scraps of paper. Trace the bottom of the jar onto a piece of paper, cut about .5″ around the circle, notch the paper around the circle and glue it to the jar. Aleen’s Tacky Glue works really well with this! Once the bottom is done, wrap the rest with strips of paper. Then I drilled a hole through the top of the cap. Make sure your hole is big enough to fit a toothpick. I wanted to have an opaque container so that they can ever-so-secretly pull a thorn and place it in the jar. In doing this, they’re not keeping tabs on each other but rather are making a personal decision to do good and make sacrifices without letting everyone know. What are you and your family doing to prepare for Easter? Share in the comments below! Disclaimer: This post contains affiliate links where I get a small percentage of sales (like really small). The products I link to have proven to work well for me and I hope they work well for you, too! Advent Calendar - Off the chain!